As I’ve gotten older, I’ve become extremely afraid of flying on an airplane and can no longer travel by air. Why would this be, and how do I get over it? It sounds like you have developed a flying phobia—a phobia is an intense fear that is out of proportion to the actual danger posed by the situation or object. Most people who are afraid to fly recognize that flying is safe, yet they find air travel very frightening. While this problem is no doubt extremely troubling to you, you’re not alone—about 20% of the population has a fear of flying that interferes with their work and social lives. Fear of flying is caused by a variety of underlying fears and phobias, which have complex genetic, developmental and environmental causes. In my experience, about 70% of those who have a fear of flying are triggered primarily by feeling trapped on a plane. Others have a fear of heights, crashing, terrorism, being far from home, physical harm such as a heart attack or stroke or even a fear of panic or losing control. Another aspect of this phobia is anticipatory anxiety—anxiety experienced in anticipation of doing something fearful in the future. Most people with a fear of flying have experienced an unexpected episode of panic while flying. Symptoms of panic can include extreme dread, sweating, breathing difficulties, dizziness and more. This typically first occurs between the ages of 17 to 34, but it can happen later in life or as early as age 11 or 12. It often occurs during a time of significant change, good or bad, which can include a birth or death…a marriage or divorce…a new job or getting fired. Very few of these fears originate with an actual technical problem during the flight. As a result of this panic episode and possible additional episodes, the individual becomes sensitized to these feelings…and to flying. He/she may start to fear that the scary symptoms will return and begin to avoid getting on a plane, which only stokes the fear. 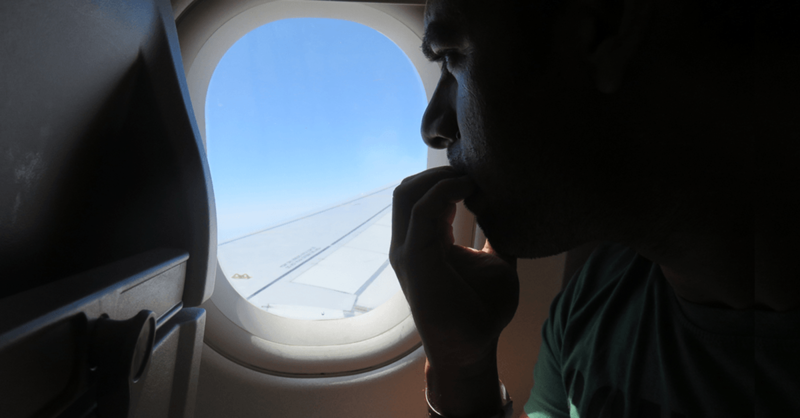 Overcoming a fear of flying takes work and commitment but is entirely possible. Identifying the triggers that produce your anxiety with the help of a qualified therapist is the first step. Exposure to feared triggers while armed with the right tools is the key for overcoming the problem. Types of therapy: Cognitive behavioral therapy (CBT)—a form of psychotherapy that helps you recognize unhealthy or unreasonable thoughts and behaviors and replace them with healthy strategies—can be tailored to fear of flying. And group therapy programs that meet at airports, available in a few areas of the country, sometimes culminate with a flight guided by the therapist. Virtual reality programs that expose patients to flight simulations can be helpful as well. No matter what type of therapy is chosen, techniques for managing anxiety will typically be taught, such as helping patients to avoid fighting feelings of anxiety, which can make them worse. Anxiety thrives on ignorance and feeds on “what if” thinking. Learning the facts about flying including how a plane flies, the meaning of various sounds, what actually causes turbulence, etc., can also help with anxiety management. Medications that treat anxiety and depression such as selective serotonin reuptake inhibitors (SSRIs) and serotonin-norepinephrine reuptake inhibitors (SRNIs) can be helpful to some people, particularly for those who have additional anxieties, but these drugs must be taken every day for a long period of time and they do have side effects. Short-acting antianxiety drugs, such as lorazepam (Ativan)or diazepam (Valium), can also provide relief for some—especially for the anticipatory anxiety—but they have side effects as well and don’t allow patients to work on underlying triggers and develop coping tools. To find a therapist and other programs that treat fear of flying, go to the website of the Anxiety and Depression Association of America at ADAA.org and click on “Find Help” and/or type “Fear of Flying” in the search box to get more information on the topic.